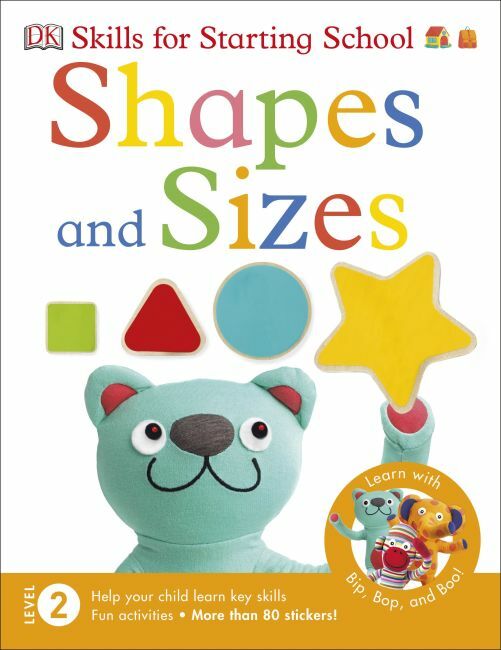 A fun, hands-on sticker and activity book to help children explore shapes and sizes, developed in collaboration with educational experts. Help your preschooler get ready for school with Shapes and Sizes. Featuring more than 80 colorful stickers, this book is filled with hands-on activities to spark curiosity and boost confidence in learning key early mathematical concepts. Children will practice recognizing shapes and describing their properties, comparing sizes, and exploring patterns. Shapes and Sizes introduces first geometric shapes such as circles, triangles, rectangles, and squares, and teaches simple vocabulary to describe sizes, including comparatives and superlatives. Playful images even encourage them to identify shapes and sizes in the world around them. Children will love learning about and exploring everyday objects through play with the funny and friendly cat, monkey, and elephant characters in Shapes and Sizes, part of DK's Skills for Starting School series.